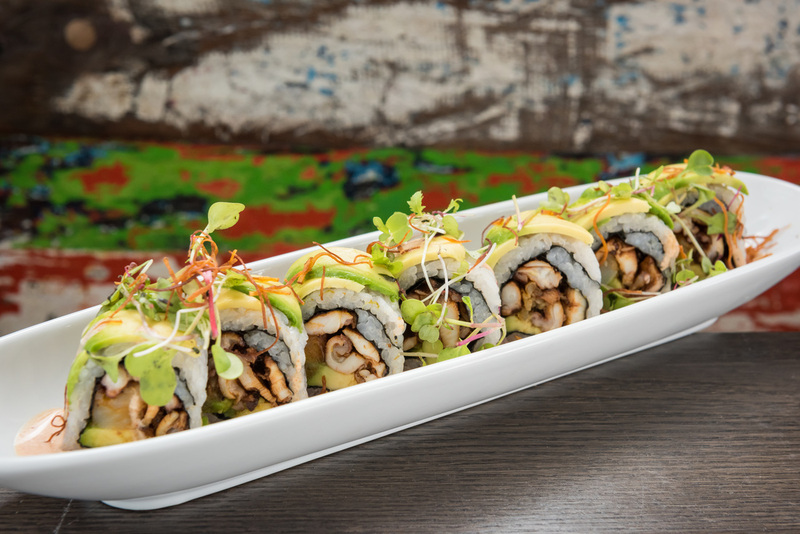 We Can’t Get Enough of Keyviche! 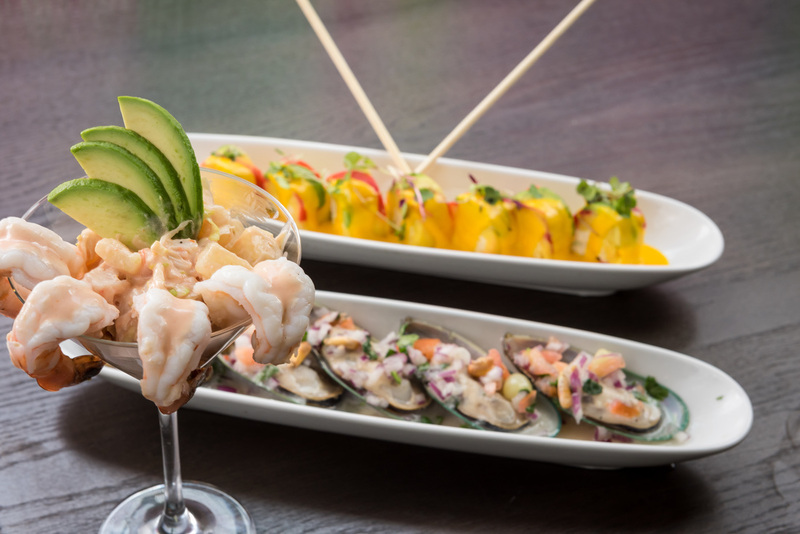 Keyviche Seafood Eatery has quickly become our go-to destination for entertaining clients, family, and friends in Key West. As the former home of Braza Lena was being renovated earlier this year, we were curious to see what would become of the vast space that originally housed one of the island’s first automotive dealerships. When the sign went up for Keyviche Seafood Eatery, we have to admit that we were a bit skeptical. With only one seafood lover in our family, we never expected to fall in love with this newest addition to the Key West restaurant scene. Were we ever wrong?!!! We can’t get enough of Keyviche. After stopping to peruse the menu during my morning run, I was delighted by the wide variety of enticing culinary selections; offering far more than ceviche. I told Dean that we would be going to Keyviche that night for dinner. From the moment we entered the dynamically designed space, we were more than impressed. 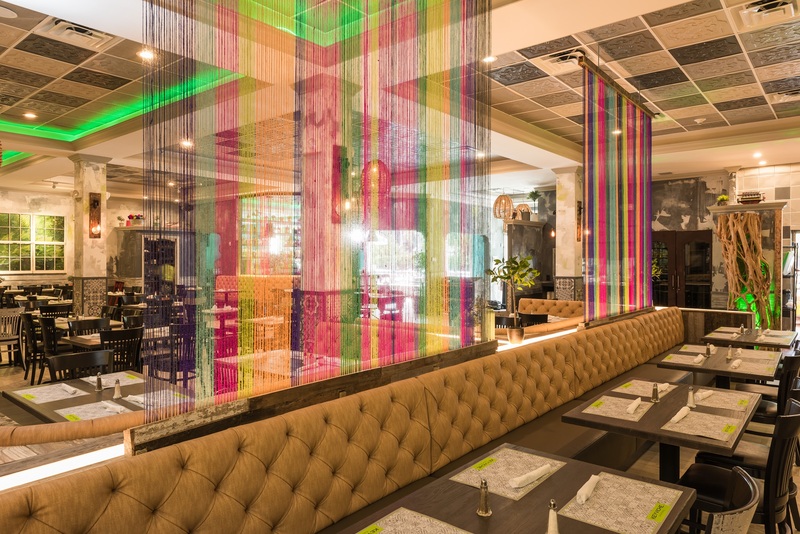 With an eclectic and creative blend of traditional and modern décor—perfectly reflecting the restaurant’s contemporary take on authentic Peruvian cuisine—the colorful interior is festive and welcoming. We love the creative use of monochromatic Spanish tiles so much that we have brainstormed using them in our home. Keyviche has successfully created a space that is equally hospitable to both large gatherings and intimate encounters. Keyviche’s food is terrific! For us, our dinner always begins with the Huancaina Salad: a heavenly combination of grilled romaine halves, croutons, and parmesan cheese, tossed in a classic Peruvian huancaina dressing. Every time we decide on our favorite entrée, we discover a new delectable delight. Dean started out loving the Peruvian Fried Rice and then fell for the Vegetable Stir Fry. On our first visit, I was blown away by the Seafood Soup and then I got hooked on the Huancaina Pappardelle Pasta. Our current winner is the Crazy Chicken/Pollo Loco: a lightly breaded chicken breast, flash fried, topped with Keyviche’s secret sauce, and served with cilantro rice and seasonal vegetables. We have always said that the key to success in any business is making your customers feel like welcomed guests in your home. Daniel Balbi, Keyviche’s General Manager and a familiar face in Key West’s culinary scene, knows how to make his customers feel like they are his most important patrons. With a gracious smile and an open embrace, the charming Frenchman always leaves us looking forward to our next dinner at his wonderful establishment. Having enjoyed more than a dozen delightful dinners at Keyviche, if we are not the restaurant’s biggest fans, we are definitely in the running. Keyviche Seafood Eatery is located just off Duval Street, at 421 Caroline Street, in Downtown Key West, Florida. They are open for dinner Sunday through Thursday from 4:00 until 10:00 and Friday and Saturday from 4:00 until 11:00. Reservations can be made at 305-432-9440. Click here to checkout Keyviche Seafood Eatery’s mouthwatering menu. 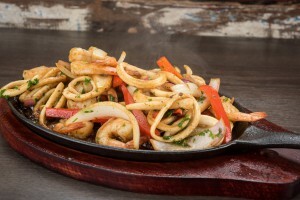 This entry was posted in Dining Out and tagged dining out, Duval Street, Key West, Key West nightlife, Key West restaurants, Keyviche Restaurant, Keyviche Seafood Eatery on November 13, 2015 by Dean. 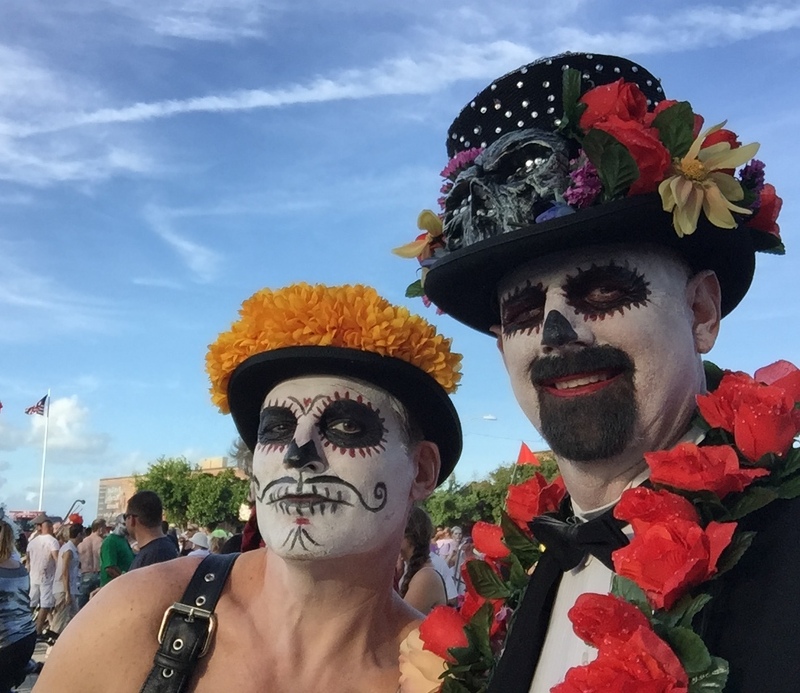 Key West’s Fantasy Fest 2015—All Hallows Intergalactic Freak Show—has come and gone. As expected, the annual, fun-filled, 10-day party in paradise did not disappoint. What fun we had! Dressed as “The Birdcage” for the Masquerade March. Showing our best “sugar skull” face. 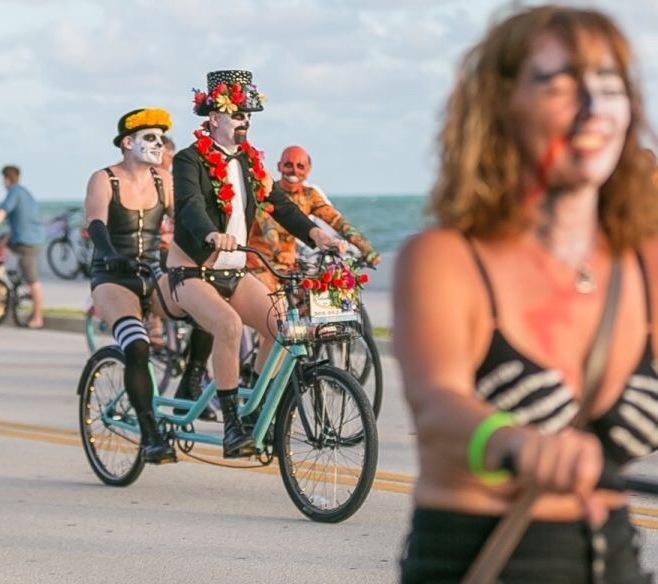 All year, we looked forward to joining the mass of zombies that took to the island’s streets for Key West’s Rock & Roll Zombie Bike Ride 2015. On a spectacularly beautiful Sunday evening, we adorned our best Day of the Dead “sugar skull” costumes and joined over 8,000 living dead riders on a path from the Fort East Martello on South Roosevelt Boulevard to the start of Duval Street. From its humble beginning with just 70 people in 2009, the annual event has proven to be a not-to-be-missed celebration. We love the Zombie Bike Ride! Dean’s amazing costume for the Headdress Ball. With more Fantasy Fest parties to choose from than we could possibly attend, we had a great time dressing up for our favorites. Dean looked spectacular as he continued his volunteer tradition of working the door at Key West’s 33rd Annual Headdress Ball. The Key West Business Guild’s annual fundraising extravaganza—held this year on the Truman Waterfront—once again proved to be a night to remember. Along with our Santa Fe friends Mark & Ken, we undoubtedly turned heads on Tutu Tuesday as we hit Duval Street wearing our pizza box tutu attire. Posing for countless pictures, we definitely felt like Britney Spears. Turning Heads on Tutu Tuesday! The Masquerade March on Friday was without a doubt our favorite event of the week. Affectionately known as the People’s Parade, the annual walking parade through Old Town Key West showcases the creativity, camaraderie, and hospitality of our island home like no other event. Shortly after last year’s parade we brainstormed with our friends Ann, Jim, Mark, and Ken and happily decided on dressing as characters from the beloved 1996 film The Birdcage. We had so much fun coming up with our costumes and were delighted by the joyful response our theme received. Political Voodoo and Ballot-Box Barbarians has been selected as the theme for next year’s Fantasy Fest celebration. Join us in our home town for all the fabulous festivities, October 21-30, 2016. We bet you will love it as much as we do! Click here to visit Fantasy Fest’s website. Click here to visit Key West’s Rock & Roll Zombie Bike Ride’s website. Click here to visit Key West’s Headdress Ball’s website. Click here to visit Tutu Tuesday’s website. This entry was posted in Entertainment and tagged Fantasy Fest, Headdress Ball, Key West Business Guild, Key West's 33rd Annual Headdress Ball, Key West's Fantasy Fest, Key West's Masquerade March, Key West's Rock & Roll Zombie Bike Ride, Masquerade March, Tutu Tuesday, Zombie Bike Ride on November 5, 2015 by Dean.